London is one of the most multicultural cities in the world, but the history of its diversity often goes untold. 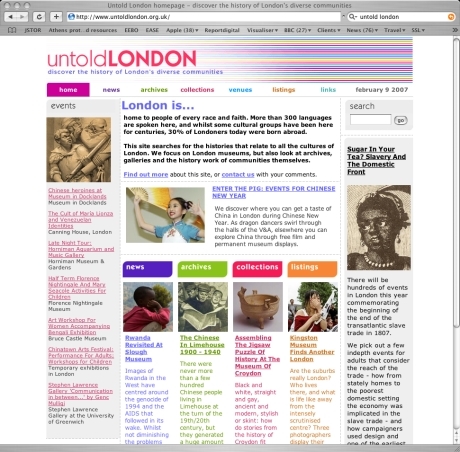 Launched in October 2005 Untold London highlights the museums and community groups that bring that history to life and draws in material from museums across the city. Visitors can browse, read the news and visit events that explore multicultural London. Kate Smith, Editor of the site said the aim of the site is two-fold: Firstly to find out what is there, and let people know where to find it. Secondly to hold up a mirror to museums so they can see what isn't there, that ought to be. The project is managed by the London Museums Hub - a consortium of four local London museums: the Museum of London, the Horniman Museum, London's Transport Museum and the Geffrye Museum - and is funded by 'Renaissance in the Regions' groundbreaking programme to revitalise regional museums for the benefit of all our current and future visitors. The London Museums Hub especially funds projects that create change and improve access to history for everyone. Together with the 24 Hour Museum we were commissioned by the London Museums Hub as consultants, technology providers and suppliers of backup materials for this site.